Prepare 6 servings mashed potatoes according to directions on the package, except reduce water to 1 cup. Briskly stir in eggs. Spread on well-greased pizza pan or cookie sheet to form a 10-inch circle, building up edges to form a slight rim. Bake in 450° oven 8 to 10 minutes, until lightly browned. Reduce oven temperature to 400°. Prepare gravy mix as directed on envelope, except reduce water to 3/4 cup. 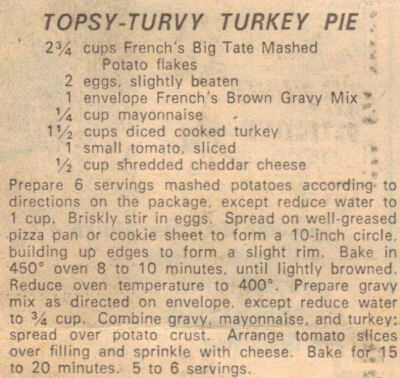 Combine gravy, mayonnaise, and turkey; spread over potato crust. Arrange tomato slices over filling and sprinkle with cheese. Bake for 15 to 20 minutes. 5 to 6 servings.